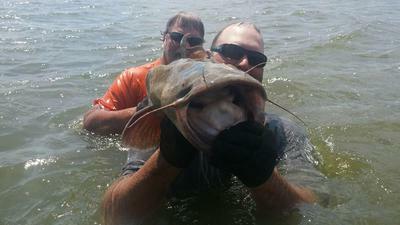 Rend Lake Catfish Guides is a catfishing guide service in Southern Illinois. 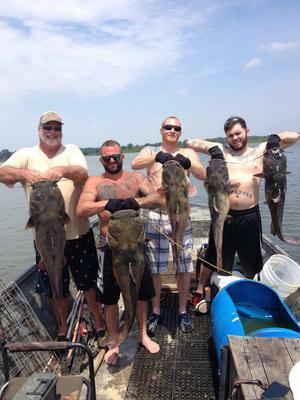 Hogging, Noodling, Hand Fishing, whatever you want to call it, we have you covered. Hogging is a form of fishing where you get into the water with the fish and use your hands as the "BAIT" - grabbing giant Catfish by the mouth and pulling them out of their holes! Flatheads move in the "holes" to hide, rest, and ambush prey during the day. The key months are June, July, and August. We will do our best to get you a chance at dragging out one of the "Big Boys". 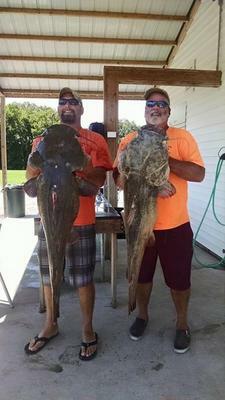 The average weight of Flatheads we catch are 25 lbs., but catfish weighing around 70 lbs. and bigger are possible too. 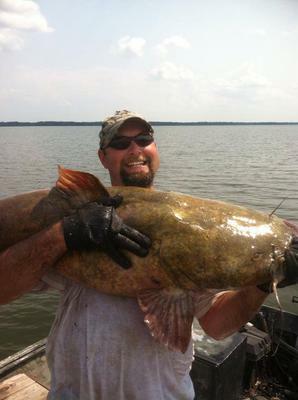 We offer hogging trips for giant flatheads on Rend Lake in Southern Illinois. Price is $$ for two people. Add $ for each additional person. We have a great success rate and usually land several nice cats in a day of hoggin. 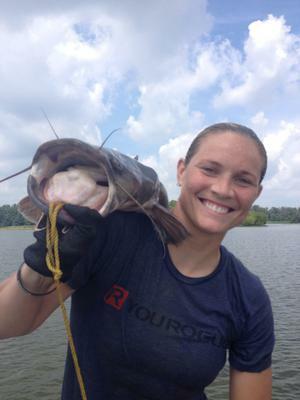 We also offer rod and reel trips for channel catfish on Rend Lake in Southern Illinois as well. Contact information can be found just below the following the pictures. 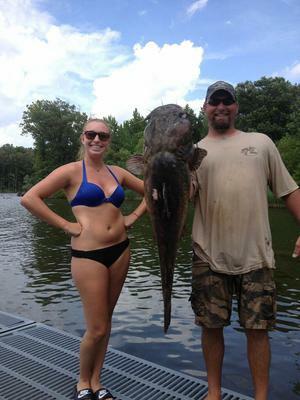 Happy lady with her big catfish. 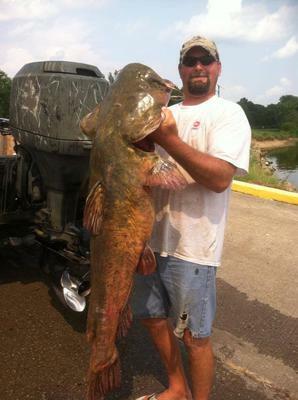 Giant catfish with Rend Lake Catfish Guides.